Nothing like a wet day in the Colorado mountains to bring the rocks down on the Grande and foul up operations. Today's rocks of the day landed about 200 feet west of the east Shoshone switch, blocking the mainline through Glenwood Canyon. According to Jay on the D&RGW list, the largest one was about the size of a coal car. 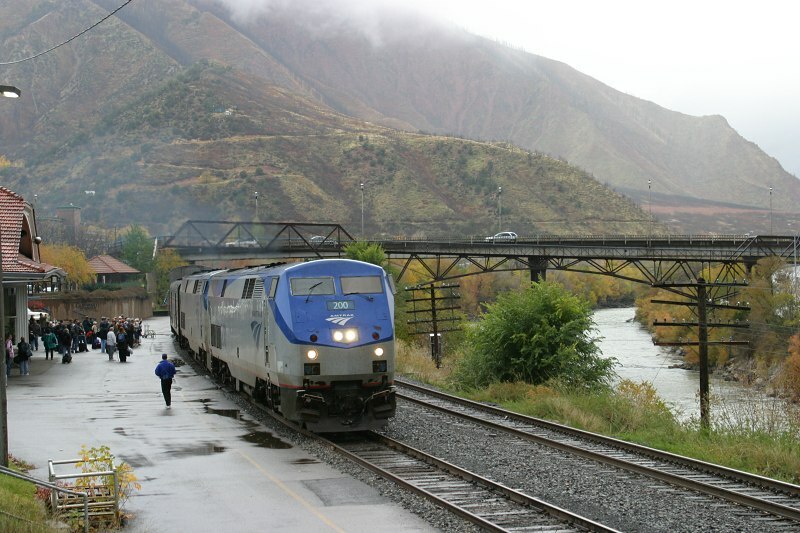 Regardless, Amtrak 5 (the westbound California Zephyr) stopped at Dotsero on the east side of the Canyon (Photo), and 6 (the eastbound Zephyr) stayed in Grand Junction until they were sure they could clear the mess. 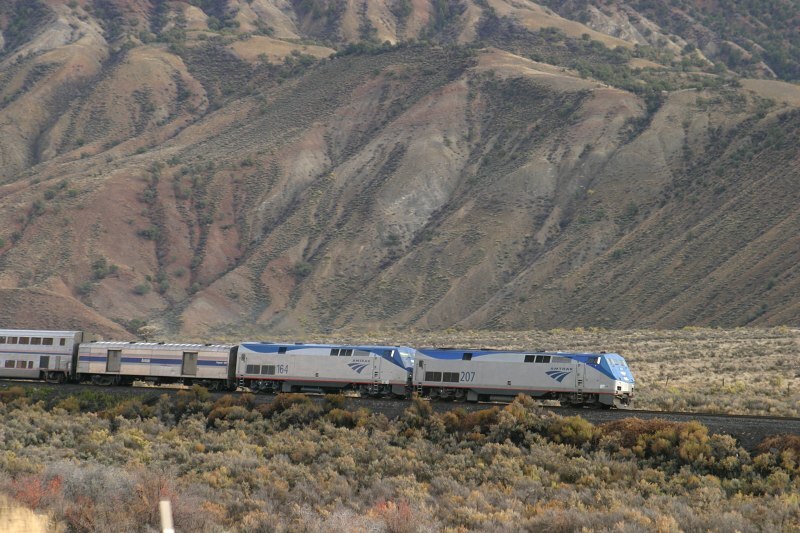 The Royal Gorge Route Railroad (otherwise known as the Canon City & Royal Gorge) recently acquired three dome cars for service through the Royal Gorge. These are no normal domes, but rather full-length dome cars. 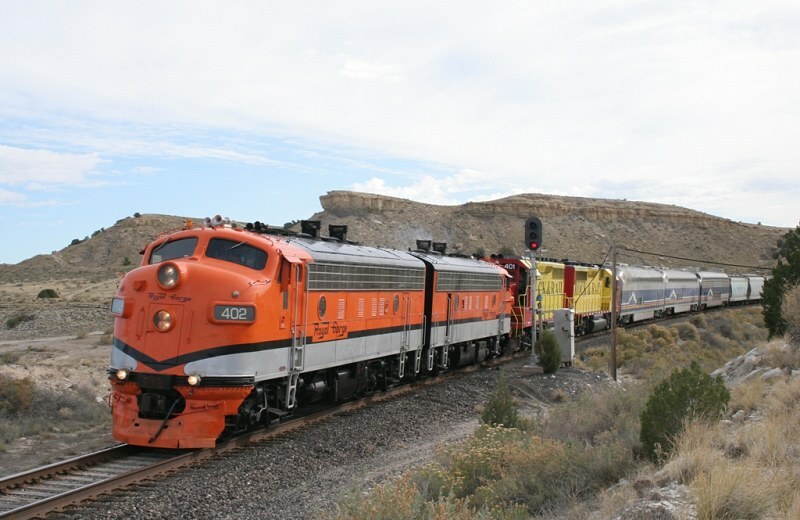 Two are ex-Milwaukee Pullman-Standard Super Domes (HALX 50 and 56), and the other is an ex-ATSF Budd Full Dome (HALX 507). Prior to this, they were in service for Holland America on their McKinley Explorer service in Alaska. The CCRG has a good write-up on the history of the cars here. Today (Wednesday, 26-Oct-2005), the CCRG sent the F7s over to Pueblo to pick these cars up and bring them back. While I wasn't able to go see this event, Nathan Zachman of Colorado Springs did manage to catch it. He sent along a photo of the move at MP 147.1 (Adobe, CO), and promises there will be move. Interesting news out this morning is that the Georgetown Loop is getting #111, a narrow gauge Baldwin Consolidation (2-8-0) that has been sitting in Breckenridge. The 111 came from IRCA originally, a 3-foot railroad operating in Guatemala. At some point, it became part of Don Drawer's collection in Fort Lupton, CO, until his passing. In 2002, it was auctioned off and purchased by the City of Breckenridge, CO. The city cosmetically restored it and placed it on a piece of track sitting on the old DSP&P grade headed to Boreas Pass. On Monday, apparently the pieces came together, and 111 was lifted from its rails to a flatbed for the journey out to the Ulrich Locomotive Works at Strasburg, CO. Denver Channel 4's website has the story here. According to the story, Breckenridge has been promised a replacement for 111. Now, since the CHS already has C&S #9, and C&S 30 (aka RGS 74, DB&W 30) torn apart, I'm guessing that things aren't going so well on the restoration of one or all of them. (Update 10/26): According to Dan Adler, 9 is coming right along, and should be in service next season. Maybe they really are just out looking for more power. No word yet on ex-C&S 30. Really this is two separate news bits. The first is the news that the Moffat is, once again, blocked. 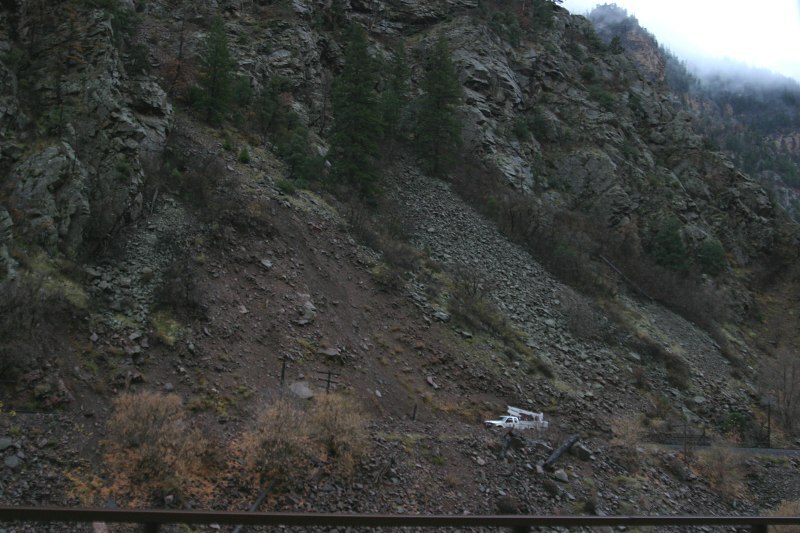 Some large rocks came down in Byers Canyon this morning, just west of Hot Sulphur Springs. Apparently they've blocked the track as well as taken out communications and power lines. While US 40 runs through the canyon, access will again be hard, as the road is always on the opposite side of the river from the railway. Over the next few weeks, you'll see quite a bit of overhauling around here. Summer is winding down and it's too cold to go ripping around the country in my convertible, thus I might actually spend time at home and work on this stuff. (I haven't spent a weekend at home in the last six weeks.) The initial changes are done - DRGW.Net is now backended by two types of content management systems (gallery and pmWiki) that will dramatically speed my ability to publish and edit content. I've already converted the main page, as well as the timetables. Over this weekend, I hope to get the rest of the "DRGW Info" content converted and dump the old cumbersome system. It will also allow me to delegate parts to others, should I find any volunteers/suckers that would be willing to undertake the task. Probably the biggest new undertaking will be a list of all the branches and a brief history of each - timeframe, reason for being, operations (if I can figure it out), etc. Other things I'm looking for are more timetables, track charts, old photos, any sort of interesting scanned paper, stories, etc. If you want to help, just drop me a line. Oh, and I just felt the need to remind everyone again - I'm horrible about responding to email. It's not that I don't like you or don't appreciate the tidbits you send in or that I don't try, it's just that I'm a horrible person who has way too many hobbies, is usually completely burned out after work, and lacks adequate mental discipline. I often forget to call my own mother back, so don't feel too bad... I really usually do my best to respond to as many as possible.